View Quest Retro Mk II review | What Hi-Fi? Technophiles have a range of tastes; some like the sleek and shine of a new smartphone, while others enjoy having a rotary phone hanging on the wall. For those that seek the middle ground – modern functionality with a retro aesthetic – then the View Quest Retro Mk II radio will scratch that itch at an affordable price. The VQ comes in an array of 11 bold colours, but for an extra £30 you can choose a range of styles including polka dot and lemon print. That same £30 can also buy you a spare battery, so you can keep the radio playing away from the confines of a power socket. The face of the VQ Retro Mk II features a clear, wide display that shows information such as the radio station and song you’re listening to, but also the time and volume level. In the middle is a small drawer that conceals a lightning port for charging (when the VQ is plugged in to power) or playing your Apple devices. It pops out at a click so you can hide it away when you’re not using it. It’s a nice extra level of functionality, but you’re going to need to take off any bulky iPhone cases, and its ridge does get in the way of the home button somewhat. The buttons used to control playback or change sources aren’t as easy to use as a conventional rotary knob. The absence of a mute button is also noticeable, especially when you have to hold down the volume key to quickly turn the radio down. You can press the middle VQ button to put the unit in standby for a sudden silence, but it’s not the same. Despite its retro design, this radio has a good range of up-to-date connections. You can use an iPod or iPhone, an auxiliary input using the 3.5mm port on the back, or its Bluetooth v2.1 connectivity; we found the latter to be stable, without any dropouts, although the VQ doesn’t connect as quickly as other radios. There’s also a USB port for charging, which is a nice addition. It’s also a pretty sophisticated radio; its DAB mode features settings for Dynamic Range Compression that reduces the difference between loud and quiet sounds, and has a ‘Prune’ function to delete stations that are either no longer transmitting or have changed frequency. The FM radio can also be played in ‘Forced Mono’, which makes weaker stations sound clearer at the expense of stereo sound. It also has six equalizer settings affecting levels of bass and treble, as well as the option to set up your own custom EQ. You can set up to 30 of your favourite stations (on both DAB and FM) for quick access by holding down the star button, which is a helpful touch. There’s also a smattering of clock options, such as setting a sleep timer or an alarm. Though the View Quest Retro Mk II radio has a pretty good sound quality, it’s not going to be able to knock our Award winner, the Pure Evoke D2 off its top spot. Blast a bit of Queen’s Another One Bites The Dust and you can hear a good amount of space between Mercury’s piercing vocals and the hefty backing bass. For a hi-fi product with such a relatively small price tag, it's surprisingly adept at keeping its sound organised. 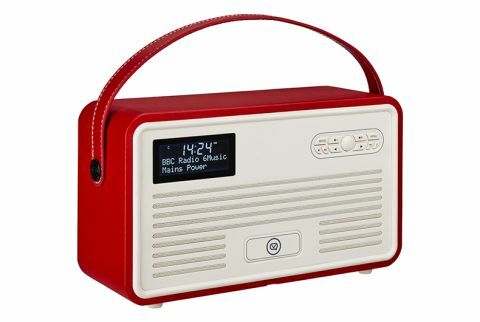 And it’s loud too – for a small radio you certainly won’t have an issue with it filling a bedroom, and it will even deliver a pretty powerful sound when played outdoors. Playing The Edge of the Wild from The Hobbit soundtrack, the horns and strings rise and fall smoothly with a pretty good sense of dynamism. The VQ’s bass is big enough to be satisfying, though. Kanye West’s Love Lockdown has some weight behind its chunky low-frequency beats that will keep the casual listener happy. It’s not quite as tight as we would like – the Retro Mk II could do with a bit more punch to truly enforce deep bass tracks – but there’s enough quantity there to make up for the slight dip in quality. There is also a drop in transparency and insight when compared to the Pure Evoke D2. The vocals in Vampire Weekend’s Unbelievers sound a little foggy, and you’ll miss out on subtle details like how singer Ezra Koenig occasionally drops the end of his words. On the whole, this is far from a dealbreaker for a low-cost radio with oodles of functionality and a pretty solid sound overall. The VQ is a versatile product, able to act as a decent Bluetooth speaker or digital radio. But for all its modern features, there’s also a nice smattering of vintage style to go with it.